Registration for the 2019 Athletic Competitions is now open! 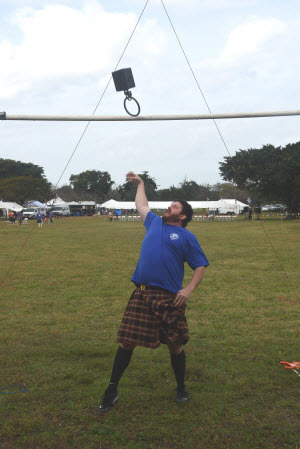 SASSF Heavy Athletic competitions are conducted under the auspices of the Scottish American Athletic Association. Prospective athletics may also wish to familiarize themselves with information found at the North American Scottish Games Athletic site. The weight is made from iron and is spherical or box shaped with a chain and ring attached. The total length is 18 inches and the weight is either 28 lbs. (2 stones) or 56 lbs. (half a hundredweight). The stone and the hundredweight are standard British weight measurements. The weight is thrown with one hand for distance from behind a marker or trig and the best of three throws is counted. The hammer head is a 16 or 22 pound iron ball on the end of a cane shaft, measuring 4 feet 2 inches overall. The hammer is thrown from behind a trig and the athlete is allowed to count the best of three throws. A 16 lb. sheaf of hay, enclosed in a jute sack is tossed over a bar with a pitchfork. The bar is raised in steady increments until all but one competitor is eliminated. Each athlete receives three tries at each height. 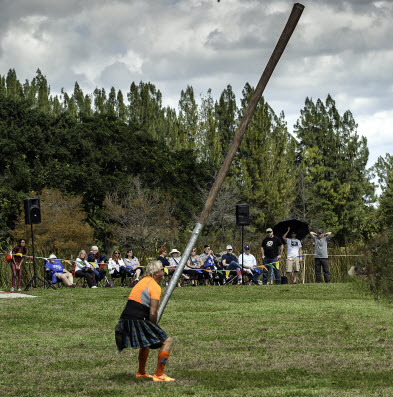 The caber is a long straight tree trunk for which there is no standard size or weight. It should, however, be too large for any athlete to toss and then be cut shorter by stages until one competitor is able to toss it end over end. 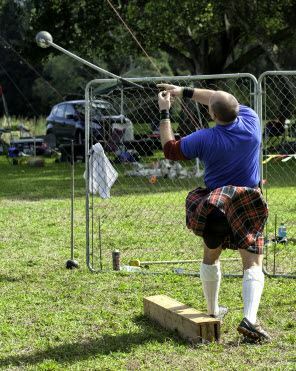 To do this athlete balances the caber on its small end and then picks it up and runs with it before heaving it end over end to land, he hopes, pointing directly away from him. This would be called a 12 o'clock throw. 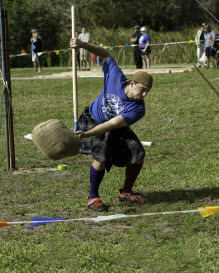 The competitor who tosses the caber closest to this position wins the day. Cabers generally measure between 15 and 20 feet long and between 90 to 120 lbs. in weight. 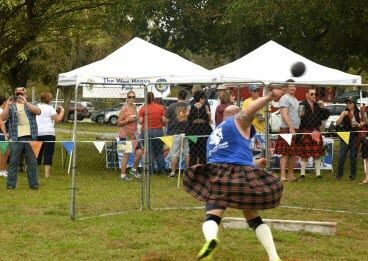 The stone of strength is the Scottish shot put. It weighs about 16 or 22 pounds. Legend has it that the distance a guest of a Scottish landlord could put the stone of strength determined the sleeping accommodations he could expect to receive during his stay. The stone is put with one hand, from behind the trig. The weight is the same as that described for the throw and is tossed upwards and slightly backwards over a bar above the athlete's head, just missing his head on the way down. He may commence at any height he wishes but, having commenced, he must continue. He must toss with one hand and is allowed three attempts. The height is measured from the ground to the center of the bar.